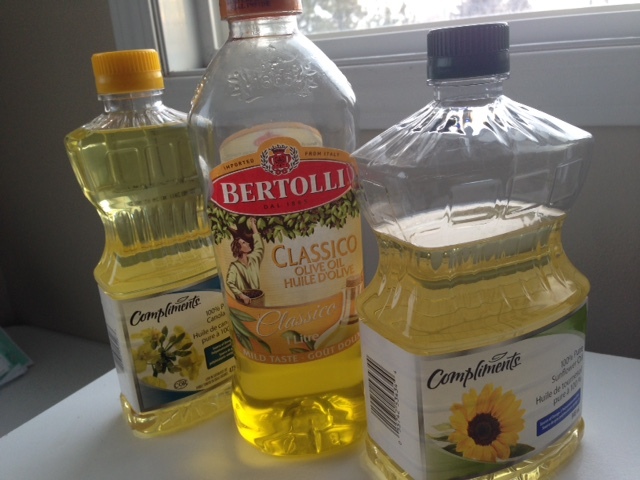 How Do Canola Oil, Olive Oil and Sunflower Oil Compare to One Another? Have you ever wondered which vegetable oil you should be using more of and which of these three oils -canola, olive or sunflower- is the ‘fairest of them all’? Of course these oils have different smoke points and so have various uses in cooking, but which is really most beneficial to consume? I was curious about this, so decided to do some research into it, and was surprised by what I found. Canola, olive and sunflower oil all carry the same caloric weight (1 teaspoon giving 40 calories), but there are notable differences. For example, of the three, olive oil provides the most monounsaturated fatty acids (approximately 3.3 grams per teaspoon). Olive oil also has a decent vitamin K content but can’t compare to canola oil, which has about 16 times the amount of vitamin K as sunflower oil (3.2 micrograms of vitamin K in a teaspoon of canola oil compared to 0.2 micrograms of vitamin K in a teaspoon of sunflower oil)! Canola oil also has slightly more vitamin E and slightly less monounsaturated fatty acids than olive oil. Sunflower oil has the lowest vitamin K content. You may be wondering, “Are there any benefits to consuming sunflower oil then?” The answer is, “Yes!” Of the three types of oil, sunflower oil (with less than 60% linoleic content) actually has the highest vitamin E content (1.85 milligrams of alpha-tocopherol per teaspoon compared to 0.65 milligrams in a teaspoon of olive oil). This may not seem like a lot, but small amounts do add up. Just two and a quarter teaspoons of this type of sunflower oil would provide approximately the amount of vitamin E in one avocado! Sunflower oil also has a decent monounsaturated fatty acid content (about 2/3 that of olive oil per teaspoon), and has four times the amount of polyunsaturated fatty acid content of olive oil. The polyunsaturated fatty acid content of sunflower oil is actually about 40 percent higher than that in canola oil. Recall that both omega-3 and omega-6 fatty acids are polyunsaturated fatty acids. So the take home message? If you ask me, it brings home the point that it is important to consume a variety of foods in one’s diet, and not just stick to one type. By consuming a variety of vegetable oils, you can maximize the nutritional benefits of each kind of oil – especially since they have different smoke points. So keep this in mind, the next time you cook, stir-fry, roast, bake or make salad dressing. Your family will benefit too! ← Intakes of Baby-Led Weaning Infants & Traditional Spoon Feed Infants – Are There Nutritional Differences?